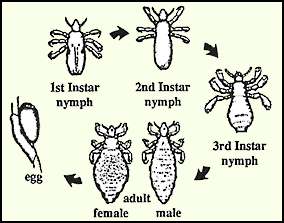 Head lice live for approximately 4 weeks and the females lay white-coloured eggs 3 weeks into their life cycle. One louse can lay up to 150 eggs in her lifetime. The eggs (nits) are small, and oval-shaped and are laid close to the scalp, usually clustered in groups. They can also be found behind the ears or at the nape of the neck. They are “super-glued” on to the hair which makes them very difficult to remove. This is where we get the term “nitpicking”. The nits hatch out after 8 to 10 days and the emerging lice are known as nymphs. They take approximately 10 days to grow to maturity, at which stage the female is ready to lay eggs, and thus the cycle of laying and hatching is repeated. Conventional treatments using pesticides are becoming less effective as the head lice become more resistant to them. The safety of the chemicals used in these treatments also raises concern. Lindane based products in excess are believed to be carcinogenic to humans. Malathion products are highly flammable. Permethrin products are now becoming less effective due to lice resistance. However, more natural methods are proving to be popular as well as effective. Mechanical methods include using a fine-toothed comb which is able to pick up the hatched lice as it is combed through the hair. This is best done on wet hair with a good dollop of conditioner rubbed in. Rubbing the scalp irritates the adult lice, making them move and the conditioner makes the hair too slippery for the lice to grip and move easily. This makes them easier to trap in the teeth of the comb. Another mechanical method which can be used on dry hair is a battery-operated comb that “zaps” or electrocutes the head lice, killing them. The current is too low to cause harm to a child. Other methods include shampoos and lotions with natural ingredients. One popular brand in the UK is Not Nice to Lice shampoo which is recommended by health practitioners and is very easy to use - available from Naturally Does It (see www.naturallydoesit.co.uk). It is safe for all the family, including babies. Essential oils are also proving to be effective against head lice but should be used with caution, especially in pregnancy and on young babies. Head lice hate Tea Tree oil so adding a few drops to your shampoo and conditioner may help prevent re-infestation. Mix all the ingredients in a small bottle. Pour some oil into palm of hand and smear over hair until it is coated with the oil. Wrap head in clingfilm, then cover with a warm towel. Keep in place for 30 minutes. Remove clingfilm and comb through hair with a nit comb, until you can find no more lice. Shampoo until all the oil is removed. Comb daily. Repeat treatment after 7 days to catch any newly hatched lice. Once head lice treatments have been used, it is important to be vigilant and continue checking the hair with a fine-toothed comb either daily or every other day. Nits are particularly difficult to kill due to the protective coating around their shell. This is why a second treatment is required after 7 to 10 days in order to catch any newly hatched lice before they mature and start laying eggs. By doing regular checks on the hair, it should be possible to control and prevent further outbreaks of head lice infestation. Head Lice are becoming more prevalent today, and can affect all levels of society no matter how clean a person’s hair may be. School children, particularly girls with longer hair, tend to be affected the most due to their close daily contact. Thankfully, there are effective ways to deal with this growing problem by simply understanding the life-cycle of the common head louse. Adult head lice can grow up to two to three millimetres long and are a greyish -brown in colour which makes them difficult to see. They move by scuttling from the hair of one person to another through physical contact. Head lice do not hop, jump or fly yet are able to move surprisingly fast. They live by biting and sucking blood from the scalp and are able to survive away from the host for up to 72 hours. This is how it is possible to pick them up from coats hung side by side in a cloakroom, or from shared hair brushes, head gear, headrests or pillows.